1. It was wonderful to arrive after a long flight from the UK via Amsterdam, and be met by Thomas Chiam (LifeQuest / AINA) and Annets Cheung (Graduate Numerologist) at Changi International Airport. They both sported sunny happy faces, which matched the heat – a pure 33 degrees. Met at Changi International Airport, Singapore by hosts Thomas Chiam and Annets Cheung. Nice to meet you. Changi International Airport basking in heat. En route to Singapore - Amsterdam Schipol Airport arrived –4 degrees and snow. Look at these wonderful Classical Clogs. 2. After a short drive in to town drinking in the luscious flowers that decorate the highways and leafy palm trees, I finally arrive tired but happy at Hotel 1929, a boutique hotel in China Town. There was even a 7/11 shop to make me feel at home. What does a 7 and an 11 mean? Ask a Numerologist. Hotel 1929, with Beautiful Traditional Orchid. 3.Out on the town already! Thomas and his lovely wife Zoë, and friend Sandy and Annets pick me up for a short walk to a local well-known Chinese eatery. They remarked that I was dressed up and looked formal – here everyone wears casual due to the heat and even business executives go jacket free. It was a relaxing evening and the locals were so warm and welcoming here in Singapore. On arrival we went out for a meal in China Town. Left to right: Sandy, Zoë, Thomas Chiam and Annets. 4. Annets took me to explore The Chinese Heritage Centre in Chinatown. It was more than fascinating, depicting real life for Chinese rich and poor throughout the ages. The Museum had recently been extended, and Annets was moved to see a thick Blue and White Chinese Porcelain Pillow, which her grandmother used to sleep on. Not quite the general idea of a hard pillow – wonder how they managed to sleep? An actual Blue and White Chinese Porcelain Pillow. There was a grand old Abacus. Think mathematics, think rhythm and movement, and recognize how the world learned to count. Annets said Abacus are still widely used in Singapore, and indeed I did notice them in shops and cafes on my travels. In England they were a novelty attraction in childhood – but they still hold a magical fascination for many. Games are very popular in Singapore / China. Like Dominoes. The Popular Game of Dominoes. The Chinese are fascinated by prediction or Divination. For example, people go to temples and ask their questions and are given a bamboo stick numbered 1 to 100. They then look up the messages or answers, which are written on pieces of paper. There are permanent set interpretations. Bamboo Sticks and Messages: Ancient Divination System. Another popular method of Divination: The Chinese also told fortunes using the Little Bird method, where a bird pecked / picked a card to tell the future. Patrons paid any amount of money for this unique and revered method of Divination. The Emperor Zhao Kuan Yin compiled the first Almanac of Chinese Surnames in 960 AD. So the first surname in China was ZHAO = (8+8+1+6 = 23/5). (Mind, expansion, communication, exploration), followed by 99 other Surnames. 100 in total form the roots of common Surnames in China. Surnames relate to Family Karma in Numerology. Surnames were a way of maintaining the survival of Clans, based on dialect, trade, places of origin, and helped the Chinese to group together when they migrated. A Chinese Lantern is traditionally displayed outside the home, with the Surname painted clearly upon the light, so you know who lives there. Everywhere you go on streets and corners, and in houses there are little places of dedication and prayer. Here is a traditional prayer set on a shelf high up in a living room. 5. Time for Lunch. Annets took me to eat at the famous Da Dong Tea House on Smith Street in China Town. It has been there in form since 1950 and is very popular. The food was great too. Da Dong Tea House. Annets checks out our Itinerary with Thomas on her cell phone. Singapore is scrupulously clean and hygienic. Wet wipes are distributed at every turn. Da Dong Tea House Wipes. HEAVEN ON EARTH. Jasmine Tea- A popular drink. China Town was vibrant with wares and shoppers. A street entertainer entertains. The day before the start of Chinese New Year Celebrations 2013 Year Of The Snake. Much excitement and anticipation. Kreta Ayer Peoples Theatre, Singapore. As the whole of the UK was covered in a blanket of perfect white snow I took a trip to Singapore where it was a hot, humid and sunny 33 degrees. It was lovely to be met at Singapore Changi Airport by my wonderful hosts Thomas Chiam (owner LifeQuest / AINA) and Annets Cheung (CPM Graduate), who kindly escorted me around town for meals (Raffles to the best Chinese Eateries around), to The Chinese Heritage Centre where I saw an ancient Abacus and an old Divination system, and out on the town for the momentous start of the Chinese New Year celebrations 2013 Year of The Snake. Most importantly, my visit was one of many exchanges that will be taking place between the UK (AIN / Connaissance School) and Asia (AINA). This was Thomas’s 4th Mega Recall Event and it was packed with around 650 people from Singapore, China and Malaysia, who crowded in to the Kreta Ayer People’s Theatre. Above the stage were two enormous overhead screens, which beamed many happy faces, numerological information, and a super photo of AIN Chairman Paul Elkerton giving a speech at the 3rd Mega Recall Conference. It was a slick presentation, as was the whole evening, and in typical Chinese fashion it was super professional and all ran to plan. Thomas said it was down to teamwork - agreed. The evening began with Corinne who was the cheery compere. The evening then proceeded with Presentations by Life Quest / AINA Teachers Mr Thomas Chiam, Master LC Tan and Mr Cha Ian Wei. The Numerological subjects explored were: Business Cards, Health Numbers, and Car Plate Numbers. It was wonderful to experience different systems of Numerology namely the more predictive. Then, I was honoured to give a Speech on ‘Success’, which had been translated in to Chinese Mandarin for a slide presentation. The screens also flashed graphics of my books and Claudine / Berenice’s Esoteric Tarot book. I was happy to then present 31 Numerology students with their graduation Life Quest / AINA Certificates. Thomas presented me – on behalf of AIN – with 3 Life Plaques (a design of his own). He also presented me with a smart AINA sweatshirt in grey and black with the numbers 96 on, and some beautiful flowers. Then it was time for a group photo. Even more happy faces! The night ended with slide presentation of the 2012 charity event in March that Thomas is organizing with his students. Charity work is regular with businesses in Singapore / China, which is wonderful. Once the event finished, people scurried to purchase Thomas’ designs and also left with a complimentary AINA Goodie Bag. Thank you to Thomas and his lovely wife Zoë Ee, Annets, and to the wonderful happy and helpful AINA / Life Quest team of volunteers who made the whole night special. Here’s to success AINA and AIN – East and West. Mr Cha Lun Wei (teacher AINA/ LifeQuest). Mr L C Tan (teacher AINA / LifeQuest). Corrine has fun with the audience. Sonia Ducie Dip.CSN.AIN ‘Success’ Speech. Speech By Sonia Ducie Dip.CSN.AIN. The 4th MEGA RECALL. AINA EVENT. Hello AINA and Hello To All Our Fellow Friends Here Today. First of All I would like to start by thanking Thomas for inviting me here, as a representative of AIN and The Connaissance School of Numerology. It is a pleasure and a privilege to be here with our co-workers for the benefit of strengthening the important union of East and West. Let me introduce myself. I have been working as a professional Numerologist for 20 years and have been giving Readings, workshops, courses, media interviews, and written 11 Numerology books during this time. I am also importantly a teacher with The Connaissance School. Numerology is the incredible science, psychology and philosophy of numbers. It is exploding in popularity reflected by the many different systems of Numerology used around the world today. When used responsibly it helps to guide us to lead more fulfilled, happier, healthier and successful lives. When we are happy, it spreads joy to others. When we are successful, it enriches others lives. When we are at peace because we are using our creative gifts and being ourselves, it inspires others to do the same. We are all unique and we can all make a valuable contribution to the world. Success is a word that’s used easily but it can mean many different things to different people. Success is a powerful word and yet it’s relative. Success can bring simplicity or complication. Its how we see success that’s important, for this will colour our motivation for the type of success we yearn for in life. On Sunday I will be giving a workshop on The Power Of Names (for businesses and personal use) and I’m gong to start right now by looking at the sound and vibration of the word SUCCESS, using the alphabet A=1, B=2, C=3, etc. to translate each letter in to a number. Each culture has its own alphabet or system and each reflects the consciousness and the experience of that culture at any given moment in time. Numerological systems have common denominators for they all speak the same message or language at the core. Numerology is a universal language that brings unity and success. 8+9 = 17; 1+7 = 8. The vowels add up to 8. The consonants add up to 9. Overall: 8+9 = 17; 1+7 = 8. So the word SUCCESS vibrates with the number 8. The word CHINA in Numerology also adds up to an 8. In the system of Numerology you use this is a Fire Element. So the word SUCCESS influences us with the number 8, 9, and 17/8 or 8. Success comes through revaluation in the 8. 8 can make us feel under pressure, so we feel our busy lives as stressful. If we keep on with the same old thing eventually life will crumble and die because we get stuck in the past. Revaluation keeps things fresh. The 8 brings the light of spirit down in to our everyday lives so that we can re-invent the past, rejuvenate, cut away the dead wood and become stronger from within. The shape of an 8 is like an infinity sign; it goes up and down to keep things moving. Number 8 highlights personal responsibility, organization, assertiveness, and asks us to grow up and stand strong. 8 can also bring competitiveness, materialism, sometimes greed, and a desire for status, power and fame. The number 9 in the consonants highlights transformation, change, education, knowledge, wisdom (that leads to compassion), and inclusiveness. It speaks of adaptability, equality, and the ability to think big. Having a 9 is an asset. It is a Wood Element in your System of Numerology. 9 is the teacher that helps us to learn our lessons at the ending of a 1 to 9 cycle, to prepare us for the new 9 cycle ahead. Success at the end of any cycle inspires wisdom, knowledge, and liberation. Overall the vibration of the word SUCCESS adds up to a 17/8, which highlights truth, honesty, integrity, and spiritual alignment. The message here is success comes from being our true selves; by using our gifts we can be luckier, healthier, happier, and more successful in life. Numerology gives us the clues and the way to change our lives for the better; it broadens our ability to create success on many levels. Now let’s explore the practical application of Numerology and success by looking at the Number 3. Everything is born out of the Number 3, or Trinity - The Mother/Father/Son - The Mind/Body/Spirit connection. Number 3 represents the Plan or Blueprint for the whole of manifestation. In your System of Numerology 3 is a Fire Element; hot-tempered, sometimes impatient but very spiritual. 1.Success in terms of Characteristics for Personality Number 3. For those born on the 3rd, 12th, 21st or 30th of any month. Mastery: Create a plan and follow through with ideas and intentions. At Their Best: Great at multi tasking, creative, communicative, go with the flow. Lesson: To stop, recognize and reflect upon life, in order to harness creative abilities and live a more abundant life. 2. Success at a deeper Soul Level. Life Path Number: Date Of Birth adds to a 3. Mastery: Learn to Be (rather than doing too much and scattering energy). At their best: Giving, caring, full of joy, entertaining, allow people to be themselves. 3.Success for a Business Name that adds up to a 3. For example, a business in the entertainment, communications, or creative industries, etc. Mastery: An abundance of joy, optimism, work, money, and creative talent. At its best: Confident, caring, and dedicated team of workers, who inspire others with their creative gifts. Lesson: This Company may need to learn to reflect and to recognize what success is, and to be less hot tempered. Finally, and most importantly, let’s now explore the quality of success in relation to our joint Association, by looking at the word sound vibration, AINA. The vowels add up to 11/2. The consonants add up to 5. 11/2 This highlights our ability to reach our highest ideals and channel our creativity into helping others and service. It’s speaks of a rise in consciousness, illumination, purification, and of bringing in more love and light to our lives and the world, together. Number 5 highlights communication, which is what we are all doing here today. It highlights concrete knowledge and how it can be applied in a practical way. It enables us to make the connection, a connection that can lead us on a deeper journey, a connection that will bring us much clarity, and then to pass on what we’ve learn to others. Overall AINA adds up to 16/7: In the System of Numerology you use this is a Water element – It’s Lucky! 7 highlights the power to fuse ideas and manifest them in to reality, love, wisdom, wholeness, and spirituality. Through group work (6) we can bring the ideas (1) together and manifest (7) change. Great expansion comes from belonging to a group, and especially connecting with our AINA group here today. So is AINA already a success? YES! Will AINA continue to be a success? YES. Success means making the most of ourselves at every level. It means being who we are and taking responsibility for our journey. In Singapore AINA is working at building up strong Characters; in the West, AIN is working at encouraging inclusiveness to harness the creative potential of soul. It’s a Great Marriage! A Perfect Union! Our connection bodes well for the future. We look forward to sharing the way and helping others. Sonia Ducie AIN presenting Graduation Certificates to 31 proud CPM Numerology Students from LifeQuest / AINA. The Kreta Ayer People’s Theatre audience were very enthusiastic and attentive to this wonderful Numerology event. Mr Thomas Chiam LifeQuest/ AINA giving a speech. Thomas Presented Sonia and AIN with ‘The Life Plaque’ one of his wonderful designs. Thomas presented Sonia with a beautiful bouquet of pink roses. Mr Thomas Chiam with his AINA sweatshirt design. All the AINA Council Members stood out from the crowd in their smart AINA t-shirts at The 4th Mega Recall Event. Sonia awaits the Kreta Ayer People’s Theatre to fill up with over 600 members of the audience. Group Photo: The 4th Mega Recall Event, Singapore. Teachers Mr Cha Lun Wei, Master L C Tan, Sonia Ducie, Thomas Chiam. 7. Annets suggested we visit the famous Raffles Hotel, and Raffles Bar home of ‘The Singapore Sling’. The Hotel and grounds were magnificent – even in the Monsoon. There are walkways all over Singapore that allow you to walk from A to B and stay dry, that’s common sense design work. We ate a perfect Chinese Meal in The Raffles Tea Room. Before food happy, after food happy. Raffles Hotel in the Monsoon. Citrus fruit are designed to ripen exactly at the time of Chinese New Year. This represents prosperity for the year ahead. Raffles Tea Room. Raffles Hotel Shop Complex. This stunning sculpture on display caught Sonia’s eye. Carrying Price tag: $4m Singapore Dollars, Qing Dynasty. She has expensive taste. 8. On Saturday 18th January Thomas Chiam, Zoë, Sandy, teachers L C Tan and Cha Lun Wei, AINA Council Member Denise, Corinne, Sandy, Annets and myself all piled in to cars to drive to Little India for Dinner, which was superb. It was a family restaurant that was a regular with Thomas and his crew. Old photos of past Singaporean governors littered the walls, and yes, there was a great Abacus. AINA Council Member Rose, with teacher Lun. Sandy, Zoë, Annets, Corinne, out for a meal on the town. 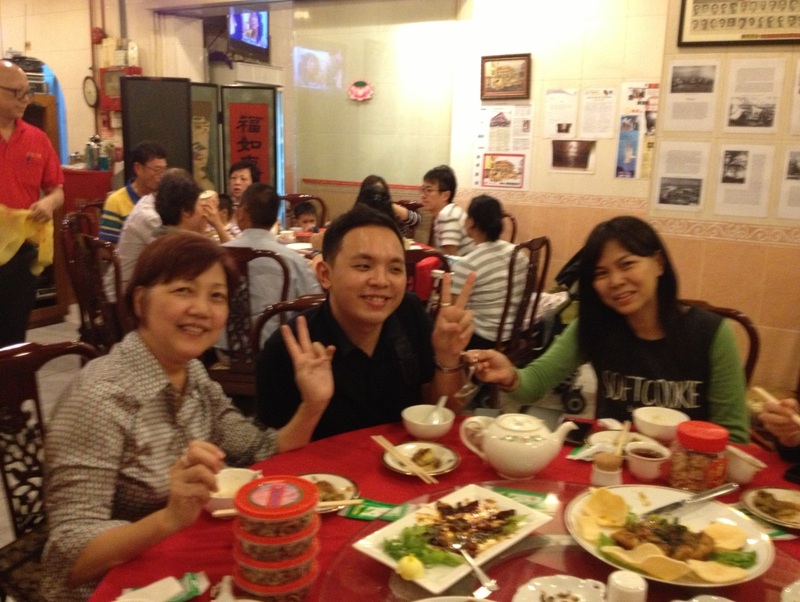 After dinner, we drove back to China Town for the start of the Chinese New Year 2013 Celebrations, Year of The Snake. On a walkabout, we saw some local men playing draughts in Kreta Ayer Square, where there was also a massive celebration of singing and creativity on stage. There were firecrackers, a sea of red decorations, and much noise, which went on throughout the night. There was a yellow illuminated snake, which winded its way around many of the local streets and was the centre of attraction – it was simply suspended in mid air. Sonia with an illuminated yellow snake that ran along the top of street: Chinese New Year 2013 Year of the Snake. Locals play Draughts together at Kreta Ayer Square. Kreta Ayer Square, Singapore. Entertainers. Sonia on tourist patrol surrounded by a Chinese Sea of Red. Chinese New Year Performers with Sonia –Thomas snapped this impromptu photo - a sea of happy smiling faces. 9.Thomas HQ. On my final day of this short visit, it was great to give a Workshop to Thomas’s students and teachers at his lovely offices at Kreta Ayer Street, Singapore. Thomas has built up a formidable reputation as a Numerology Teacher in Singapore over the last 4 years and his company is called LifeQuest Training Hub. He is affiliated with AIN and his business is known as AINA in Asia. The Numerology of Names Workshop. Sunday 19th January 2013, LifeQuest / AINA HQ, Singapore. It was organized late in the day, but Thomas gathered together 21 of his most loyal CPM graduates and Life Quest Teachers for my Numerology of Names Workshop at his Singapore HQ. The workshop focused on the energy of the numbers one to nine and the sound vibrations of the CPM’s names. Each student came up front and sounded their names, which was a powerful and moving experience, and the room was charged with energy. There was also an excited group discussion regarding the many different ways the shape of the number 7 can be written, with students demonstrating on the board. Thomas successfully translated the whole of my speech into Chinese Mandarin, with Stanley and Annets chipping in at times. They were an enthusiastic crowd, and it was an engaging and insightful day. Finally, Sonia presented the students with their Certificates of Attendance then a photo, and then sat for a group photo. The day ended with some book signing and a great deal of interest in finding out more. Hence, the Foundation Course and more Workshops are being planned for Singapore. Thank you Thomas for sharing your skills, space and hospitality with AIN. The Reception at LifeQuest / AINA HQ. Kreta Ayer Street, Singapore. Welcome to The Numerology Of Names Workshop, Sonia AIN. Thomas during a tea break. He translated Sonia’s words in to Chinese, although most CPM’s were bi-lingual, which is common in Singapore. Team Work. Sonia and Catherine at The Numerology of Names Workshop, Singapore. Monsoon season; an umbrella stand. Group photo: We love Numerology! Sonia presented Certificates to the AINA members. More happy faces. 10.As the workshop finished it was just time for Lui and Annets to drive me to the airport for my night flight to UK via Paris. Singapore may be full of skyscrapers tall and stunning, beautiful orchids, great culture, wonderful food, and is scrupulously clean but my most vivid memory is of smiling happy people. Or perhaps that’s just the company I kept – Numerologists are positive people! Paris Charles De Gaulle in snow. Whilst I had the luxury of a Jumbo Jet on my 14 hour flight to Paris, the rest of the journey was a bit of a wash out – England was covered in snow and closed to business. However, eventually I made a hop across the English Channel on this quaint Air France plane. Is it a bird? Is it a plane? Thomas Chiam is visiting the UK in April to give Numerology Workshops, and AIN Members will be continuing to teach Numerology Courses and Workshops in Singapore. World here we come.